I know I should not do this but I've been thinking. With a bit of a stretch, this has been a week of awards, some honorable, some not so. 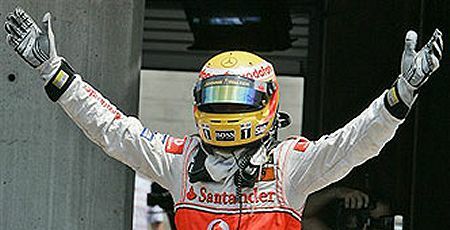 For a start, there were those ten grid spot penalties handed down to Lewis Hamilton and Nico Rosberg for their red light bloopers in the Canadian GP. Fair enough, says Nico, foul, cries Lewis. Which raises the matter of fairness in penalizing mistakes as opposed to deliberate infractions of the rules. Regardless of whether you think the penalties harsh or lenient, the fact remains that the FIA has penalized a mistake in this case. I just cannot believe that Lewis intended to take himself out of the race and remove his strongest competitor at the same time. There are plenty of precedents for the awarding of penalties for mistakes, of course; probably most of the blocking incidents in qualifying are unintentional. But the Hamilton/Raikkonen accident does raise the question of how the stewards decide the penalty to be awarded in the case of a mistake. Presumably, it should be less than for a deliberate contravention of the rules and that opens the old argument about standardizing penalties for specific offenses. There does seem to be a good case for setting down a scale of penalties to be awarded. One big problem is that situations do vary and sometimes entirely new ones come along, as in the case of Hamilton's error. So there will always be an element of human judgement involved and, equally, arguments over the fairness of a penalty will ensue. Elsewhere, the week's awards were somewhat happier. Ron Dennis was awarded the Prince Philip Medal for innovation and excellence in engineering, which he accepted for the whole McLaren organization. No-one seems to have noticed the irony of the award going to a man at the head of a company so recently pilloried and fined extravagantly for bringing the sport into disrepute. It seems to me that not everyone was in agreement with the FIA's opinion on the matter and the award looks very much like a slap in the face for Max Mosley. Congratulations are also in order for John Surtees, a childhood hero of mine. Famously the only world champion on both two wheels and four, Surtees has been awarded an OBE in the Queen's Birthdays Honours list. It is not often that motor sport is remembered when the gongs are handed out and so it is good to see John rewarded at last. He does not have as high a profile as Sir Jackie and Sir Frank but he has been just as valuable an asset to the sport even so. Oh, and I received an award of sorts this week too. To my surprise, I had an email from the Webteam of ING Renault F1 informing me that, as one of 20 "influential F1 blogs", F1 Insight has been selected to be involved with their new "Broadcast Programme". If it lives up to half of their expectations, it could be a very good idea and, naturally, I am somewhat flattered to be included. First of all, congratulations on your promotion to top notch blogger. Feels kind of cool to have been a part of this page and then find out that it's about to become renowned world wide. Happy days at your office i believe. So tell us all about the new ING sponsored program. Congratulations Clive! Hope the broadcast programme goes well, and you deserve to be in the number. Either my e-mail has been delayed in cyberspace like the "put extreme wets on or else" one to Ferrari was in Japan 2007... ...or I haven't been elevated to the same status as you. I suspect the latter. I suspect 20 was the number of bloggers the staff at ING thought they could sensibly handle at once - not much point promoting someone to "Officially Influential Blog" status if the Renault staff find themselves with such a work overload that they can't give the bloggers the attention they deserve. Incidentally, triple WTCC champion Andy Priaulx has also been made an OBE by the Queen. We are not worthy. Well done on being so influential. My reading of the Ron Dennis award is the same as yours although I am sure Max will be pleased if it was meant to be a slap in the face to him..... He likes that kind of thing and this time he didn't have to pay or be plastered all over the papers. Great to see Surtees honoured even if the honour in question is several decades to late and frankly patheticly low for the level of his achievement. Pinsent got a knighthood for winning 4 races in a rowing boat. Hardly compares with what Surtees did. Congratulations Clive ! Been a big week for you, hasn't it? Tell us more - what does the Broadcast Programme entail? Is there money in that Renault thing? Either way, it's pretty awesome to be told you're "influential" by someone that is actually in the sport. As for the penalizing of mistakes, I remember stumbling across the laws of Rugby Union, and the laws of Ultimate Frisbee, which of the craziest things that they can have in common besides a round object and a square field, they both have a Sportsmanship law. Law zero in Ultimate Frisbee says that all infractions are accidental, because an intentional infraction would be cheating, and since we're all amateurs playing this game, there is no reason to cheat. Despite that, there are still laws in the game that can be accidentally broken, and penalties (a free kick or free toss) should be given. I believe Lewis was steering to slow his car when he hit Raikkonen, had Kubica been on the left he would have steered the same way. The problem isn't that Lewis has a ten grid spot penalty for failing to stop his car, the problem is that there is not a way to let Raikkonen finish his race, and like all the unintentional blocking in qualifying, they never actually award drivers that couldn't pass another hot lap or a grid spot advance, they remain out of luck. Thanks to all. As to what the Broadcast Programme will contain, that will likely be content from Renault like photos, videos, podcasts and information. Exactly how it will work remains to be seen as they are still working on that (they are conducting a survey to establish what the bloggers want), although I think the aim is to provide a widget, rather like the Schmap one in the left sidebar of F1 Insight. Obviously, it is good advertising for the team and company (I wish other teams were as aware of the internet's potential as are Renault) but the blogger benefits too by offering more to the readership. So everyone wins, I think. Finally, the money question; hah, you must be joking! Congratulations on the promotion of sorts. Thanks, Andrew. Formula1Sport is down at the moment, as you know. The hacker finally managed to bring everything crashing down and the owner is having trouble getting things working again. Having said which, he was about to transfer everything to me and my son, Mad, and I were going to move it to his server (which should solve the hacker problem). Hopefully, this will still happen and we can get the site up and running again in a few days. Sorry about the indefinite nature of the news but I really don't know how long it's going to take. As for time, the new promotion should actually save me time, since the idea is that Renault provides the info without me having to do a thing. It should add a great deal of extra facilities to the blog, things that I have always wanted but have never had the time to do myself. Nope I've not had anything from Renault - well done Clive!